Rising unemployment rates and mounting home foreclosures are putting new pressures on Congress to do something. Some lawmakers are revisiting the idea of bankruptcy cramdown to encourage voluntary modification by lenders, or to enable forced modification by the bankruptcy courts. Passage of this cramdown legislation would give Federal bankruptcy judges the authority to modify bankruptcy debtors’ mortgage contracts by lengthening terms, cutting mortgage rates, or reducing loan balances. The current bankruptcy law allows modification of some contracts, but not home loans. House Financial Services Committee Chairman Barney Frank (D-Mass.) has announced his intent to push for legislation giving bankruptcy judges the authority to modify home mortgages. The Huffington Post reports that Frank has met with key members of the Senate Banking Committee who are ready to make a serious push at major financial regulatory reform before the year was out. If you are behind on your mortgage and experiencing difficulty with your lender, consult an experienced bankruptcy attorney for advice. There are many options available to homeowners, and new opportunities are developing, but quick action is still vital to your chances for a positive result. Take control of your situation by learning your rights and legal options. The Law Office of Erich M. Niederlehner, PA has 4 convenient locations in Mobile, Pensacola, Fairhope and Fort Walton Beach. Please call toll free 877-607-2228 to schedule a free consultation. Congress has designated us a debt relief agency. We help people file for bankruptcy under the bankruptcy code. No representation is made that the quality of the legal services to be performed is greater than the quality of legal services performed by other lawyers. Main office is in Pensacola, Florida. No attorney client relationship is established by using this website. Many older Americans struggle each month to pay credit card debt with a modest income. Often paying unsecured debt is a tremendous burden and requires a sacrifice of basic necessities. Sometimes the elderly conserve utilities, or cut back on food, or forgo prescription medication to pay credit card companies. The subject of bankruptcy is especially difficult for elderly people who may cling to preconceptions that are out-dated or otherwise incorrect. There have been many changes in the laws that protect an elderly person’s ability to meet basic monthly living expenses. Many retirement accounts and social security income are protected from creditor garnishment. Additionally, elder Americans are often judgment proof, meaning all income and assets are protected from creditors. Unfortunately, many older Americans fail to take advantage of these protections because they believe they can honor their obligations by paying minimum payments each month. The sad truth is that it often takes decades to pay off a credit card by making minimum payments. The stress and worry over repaying unsecured debt can cause health issues for young and old. A great deal of this stress and worry can be alleviated by choosing a feasible plan to either pay or discharge this unsecured debt. Bankruptcy is one tactic for managing unsecured debt and for reorganizing an elderly person’s finances. An experienced bankruptcy attorney can explain your options and provide solutions for living on a fixed income. Don’t let credit card debt turn “the golden years” to rust. American author Mark Twain was fond of saying, "There are three kinds of lies: lies, damned lies, and statistics." While it is important to scrutinize any statistic with a healthy dose of skepticism, bankruptcy statistics can help attorneys, courts, creditors, and even debtors understand who is filing bankruptcy and the reasons. In 2008 there were 1,074,225 consumer bankruptcy filings. For the second straight year, Tennessee had the overall highest per capita rate of filings, with 7.65 filings per 1,000 residents. Put another way, that’s one-and-a-half people out of 200, per year. While these bankruptcy statistics are enlightening and even useful, no two bankruptcy cases are the same. Unfortunately, some firms take a “one size fits all” approach to bankruptcy. If you are experiencing financial difficulty, seek out a qualified bankruptcy attorney to explain your rights and treat your case with the care and attention you need and deserve. Don’t be treated like just another statistic. The Law Office of Erich M. Niederlehner, PA has 4 convenient locations in Mobile, Pensacola, Fairhope and Fort Walton Beach. Please call toll free 877-607-2228 to schedule a free consultation. Congress has designated us a debt relief agency. We help people file for bankruptcy under the bankruptcy code. No representation is made that the quality of the legal services to be performed is greater than the quality of legal services performed by other lawyers. Main office is in Pensacola, Florida. No attorney client relationship is established by using this website. First, ignoring credit card obligations will cause a persistent series of harassing telephone calls and letters from credit card companies, collection agencies, and finally law firms. Phone calls are systematically made to the debtor’s home and work, and sometimes to third parties including neighbors, extended family, and your employer. The agencies that collect credit card debt are experts at telephone harassment – it is one of their most important weapons. Bankruptcy, on the other hand, stops all collection calls. Second, your credit score will be ruined on a continuing basis. For each month that a credit card goes unpaid, the creditor will report negatively to the credit reporting bureau. Additionally, collection agencies will often further harm your credit score by “resetting” the date of last activity when the account is transferred to a new collector. Bankruptcy stops all negative reporting. Discharged debts should be identified as “Discharged in Bankruptcy” with a zero balance. The debtor’s credit report and score can begin to recover from the date of the bankruptcy discharge. Third, you can (and will) be sued. The typical consumer will undoubtedly lose a lawsuit over a legitimate debt. The resulting judgment may include substantial penalties, interest, court fees, and attorney fees. A judgment creditor can collect from your wages, your property, and your bank account. While there are some people who are judgment proof, they are the exception and not the norm. Most people have assets that a judgment creditor can attack. Bankruptcy prevents all lawsuits and even stops collection actions from judgment creditors. Many consumer advocates have likened credit card debt to an illness. Like any illness, the cure is not found in ignoring the problem, which will only make things worse. If you are sick from credit cards and are unable to pay your debts, consult with a bankruptcy attorney and find the cure! At the Law Office of Erich M. Niederlehner, PA we encourge you to take control of your financial future, ignoring your problems will not make them go away. So if you have mounting credit card debt - Go Green! Cut up the plastic. Why a Preference Payment is a Bad Thing? When we were children a preference was a good thing, such as: I prefer Johnny on my team for kickball; or my preference is chocolate ice cream. In the bankruptcy world a preference payment is a bad thing. A preference payment is a transfer of money by a debtor, on account of a pre-existing debt, that is made while the debtor is insolvent, and gives the creditor more than it would receive from the liquidation of the debtor's assets during a chapter 7. The idea behind a preference payment is that the debtor chose to pay a certain creditor instead of other creditors – the debtor “preferred” this creditor. Preference payments are unfair to the debtor’s other creditors, and, if the transaction took place within 90 days, the bankruptcy trustee can compel the turnover of this preference payment to the bankruptcy estate for equal distribution to all creditors. And there is one other important caveat to preference payments: if the payment is made to an “insider,” then the avoidance period is one year. An “insider” is a generally a relative, business partner, etc. who has a special relationship with the debtor. A common preference payment scenario is a payment by the debtor to a family member on account of a previous debt. For example: Mary borrows $3,000 from her mother to help pay bills. In March Mary receives her income tax refund and repays her mother the $3,000. Mary files bankruptcy in May, and doesn’t tell her bankruptcy attorney about the March payment. The trustee learns of the payment while examining the debtor’s bank statements and sues Mary’s mother to recover the $3,000 for the bankruptcy estate. This awful situation for Mary and her mother can be easily avoided. First, do not withhold information from your attorney. Second, provide your attorney with any requested documents. Third, do not pay any creditor (or relative) without first consulting with your attorney. Cooperating with your attorney can ensure that your bankruptcy case is preference-free. Fairhope, AL 36532. This makes our second office in Alabama. The an office in Fairhope should provide convenient access for everyone in Bladwin County who is experience financial troubles and would like more information about bankruptcy and how it may help their situation. The “Co-Debtor Stay,” also known as the “Co-Debtor Automatic Stay,” is a feature of a Chapter 13 Bankruptcy designed to protect a debtor by insulating him from indirect pressures from his creditors exerted through friends or relatives. The Co-Debtor Stay stops all collection actions against any individual who is obligated on a consumer debt owed by the debtor. The Co-Debtor Stay continues until the Chapter 13 case has concluded. The Co-Debtor Stay is not a direct protection intended for the co-debtor. The debtor’s Chapter 13 Bankruptcy will not discharge the co-debtor’s responsibilities to the creditor. It will, however, prevent collection action by the creditor against the co-debtor (e.g. lien perfection or even adverse notation on the co-debtor’s credit report) during the pendency of the Chapter 13 case. The Co-Debtor Stay is effective immediately upon the filing of the debtor’s Chapter 13 petition and continues until the case is closed, dismissed, or converted to Chapter 7 or 11. The Bankruptcy Court can also modify or terminate the Co-Debtor Stay upon the motion of a creditor. The creditor may be successful in this type of motion if the codebtor received "consideration" for the debt (e.g. you cosigned a car loan for your brother, who actually owns the car), if the debtor’s Chapter 13 plan proposes to not pay the debt, or if the creditor's interests would be irreparably harmed by continuation of the Co-Debtor Stay. The Co-Debtor Stay is a powerful tool to prevent collection action in Chapter 13 Bankruptcy. If you are contemplating a bankruptcy filing and have co-debtors, consult with an experienced bankruptcy attorney. An experienced bankruptcy attorney can explain your options and work with you to find the best result. The Means Test is a formula designed to identify debtors that can afford to pay some of their unsecured debts (for instance, credit card debt) and encourage repayment of these debts through a Chapter 13 repayment plan. Debtors that “fail” the Means Test are disqualified from filing Chapter 7 bankruptcy. If your family’s income is less than your state’s median income for a family of your size, you PASS the Means Test. There is no other testing and you can proceed with a Chapter 7 bankruptcy. If your family’s income is more than your state’s median income, you must complete the Means Test worksheet to calculate if you have (or should have) money to repay unsecured creditors. In the end if you are able to pay a significant portion of your unsecured debt, you will FAIL the Means Test and cannot file a Chapter 7 bankruptcy. The truth is that very few debtors fail the Means Test. Many debtors earn significant incomes and still qualify for Chapter 7 bankruptcy. Debtors with large monthly secured debt payments (e.g. house, car) often pass the Means Test as there is no extra money at the end of the month to pay unsecured creditors. If you are contemplating a bankruptcy filing, it is in your best interest to consult with an experienced bankruptcy attorney as soon as practical. The Means Test is a new and complex feature of the bankruptcy laws, and, consequently, its application and interpretation varies from jurisdiction to jurisdiction. By examining your case early, a skilled bankruptcy attorney can identify whether you are able to pass the Means Test now or in the future. A chapter 13 bankruptcy is also called a “reorganization plan” or a “wage earner's plan.” A debtor who files a chapter 13 bankruptcy intends to repay all or part of her debts in installments to creditors over three to five years. The individual’s repayment plan term cannot exceed five years. There are a number of advantages that chapter 13 affords to debtors. The most significant is the ability to stop a home foreclosure and force the creditor to accept payments for any delinquent mortgage payments. The bankruptcy automatic stay stops foreclosure proceedings immediately upon the debtor’s bankruptcy filing with the court. However, this temporary relief may be lost if the debtor fails to make the regular mortgage payments that come due after the chapter 13 filing. Will My Bankruptcy Be Published in the Newspaper? Bankruptcy is a legal process and a matter of public record. In the past newspapers have published local bankruptcy filings in the “public notices” section. Today this practice is not practical due to the large numbers of bankruptcy filings. Recently the American Bankruptcy Institute projected that individual bankruptcy filings nationwide would reach 1.4 million in 2009. Newspapers report news that is of interest to the community, so unless your name is Donald Trump or Burt Reynolds, your bankruptcy filing simply isn’t newsworthy. The process of opening a case in the bankruptcy court is actually very confidential. Once you file a bankruptcy petition a notice of the filing is mailed to all of your creditors. Other than receiving notice of the bankruptcy filing from the bankruptcy court, there are only a few ways to learn of a bankruptcy case. The most common way is to contact the bankruptcy court by telephone. Most bankruptcy courts have an automated telephone system that will provide basic case information to the public. Another common way to learn whether an individual has filed a bankruptcy is to use the Public Access to Court Electronic Records (PACER), an electronic public access service that allows users to obtain case and docket information from Federal Appellate, District and Bankruptcy courts via the Internet. PACER registration is free, but the system charges the user $.08 per page. Finally, some lenders subscribe to bankruptcy information services. These services harvest public records daily and sell the information for a variety of purposes. It is surprising to many debtors in bankruptcy when they receive invitations from businesses seeking to loan money or finance automobiles. As you can see, the bankruptcy process is actually very confidential. While there are no guarantees that your friends and neighbors will not learn about your bankruptcy, chances are they will not unless you decide to tell them. However, every case is different. If you have specific questions about the effects of filing bankruptcy, please consult with an experienced bankruptcy attorney. There is a minimum amount of debt required to file bankruptcy. Not so. There is no debt threshold you must meet in order to file bankruptcy. Bankruptcy is essentially a legal declaration that you are unable to pay your obligations. That determination varies from case to case. You can’t keep your home or car if you file bankruptcy. False. In fact, many individuals file for bankruptcy protection in order to save their homes from foreclosure or their vehicles from repossession. Incorrect. While it is true that taxes are difficult to discharge in bankruptcy, it is possible to discharge tax debt under certain circumstances. If you have tax debt, discuss your options for repayment and discharge with a seasoned bankruptcy attorney. Absolutely wrong. Medical bills are generally among the easiest type of debt to discharge in bankruptcy. This is a dangerous myth. Not all debts are discharged in bankruptcy. Family support obligations and student loans are two examples of debts that are generally non-dischargeable (although certain exceptions exist). It is important to discuss all of your debts with your bankruptcy attorney to determine which debts can be discharged in your bankruptcy case. No way! Debtors in bankruptcy are surprised to receive legitimate credit offers in the mail even before their bankruptcies are discharged. Rebuilding your credit after a bankruptcy is an important issue and should be discussed with your attorney. This is inaccurate. Federal bankruptcy law mandates that the debtor list all creditors on the bankruptcy schedules. There are several different ways that a debt may survive the bankruptcy (e.g. 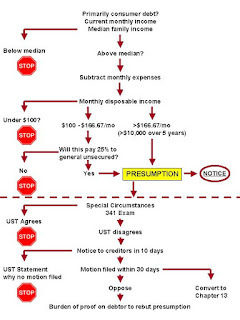 a non-dischargeable debt, or the debtor executing a reaffirmation agreement). Non-disclosure of a debt may prevent a discharge of your other debts and could land you in criminal trouble for bankruptcy fraud! Erroneous! Under the current bankruptcy laws an individual debtor can file a chapter 7 bankruptcy every eight years. An individual who has received a chapter 7 discharge may also receive a chapter 13 discharge after four years. Recently the House of Representatives Judiciary Subcommittee on Commercial and Administrative Law held a hearing to initiate legislation to change provisions of the federal bankruptcy law that give student loan lenders an advantage over other consumer loans. Current bankruptcy law provides that student loans are generally not dischargeable under any chapter of the bankruptcy code unless the debtor can show that repayment of the loan creates an "undue hardship." Unfortunately, Congress did not define "undue hardship" in the bankruptcy code, so this interpretation has been left to the individual bankruptcy court judges. During the Committee hearing Rafael I. Pardo, an associate professor at the Seattle University School of Law who has studied the discharge of student loans in bankruptcy, challenged Congress “to clarify the undue hardship standard.” Many courts view "undue hardship" as a high bar that is only met by a showing of exceptional circumstances (like physical or mental disabilities, or poor or no future earning potential) that result in an inability to both repay the student loans and provide a minimum standard of living for the debtor and the debtor’s family. This is a very difficult burden for most debtors to meet, and consequently bars the discharge of student loans in most cases - even while other consumer debts like auto loans, credit cards, medical debts, mortgages, and even taxes are discharged in the debtor’s bankruptcy. For the time being it remains extremely difficult to discharge student loans. However, there are other non-bankruptcy programs for debtors unable to repay their loans. In some cases debtors may qualify for reduced payments, deferment, forgiveness or cancellation. Chapter 13 bankruptcy can also provide a way to cure defaulted student loans, or pay them off during the bankruptcy. If you have student loan debt, discuss your situation and options with a qualified bankruptcy attorney.